My wife and I just purchased a new vehicle this summer and when considering this new “adventure vehicle” we thought we’d go back to a pickup truck. We had been driving a Nissan Xterra SUV which has served us well. SUV’s are nice and have their advantages but with what we like to do: kayak, paddle board, trail work & mountain bike, we thought a crew cab pickup would fit the bill. With that said, we had gone over options for transporting bikes. We own a Thule two-bike hitch mounted rack but it’s getting old and rusty. We have our eye on another model of bike rack but until we save for that, I wanted to get a tailgate pad for carrying multiple bikes without much hassle. After checking out several friend’s tailgate pads I decided on the Race Face model. 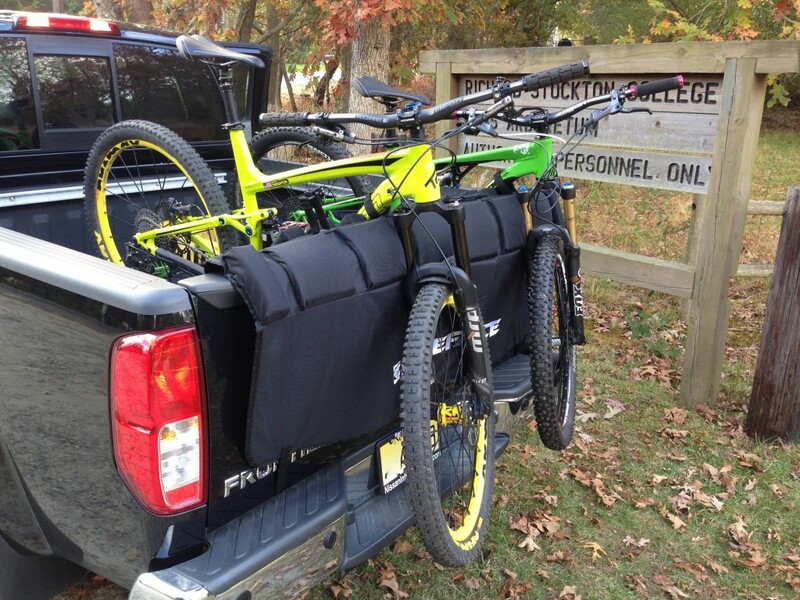 This tailgate pad is really nice and takes into account all the needs for carrying bikes in the bed of a truck. For the majority of the time I’ve only had to carry one bike using this tailgate pad and used it for several long drives (2+ hrs) without any issues. Throwing our two bikes in is simple and keeps them separated during transport. 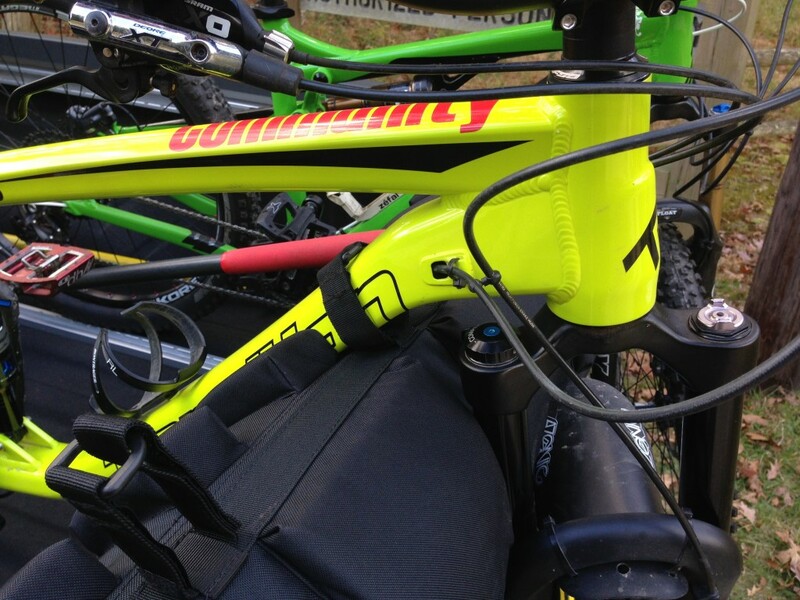 Carrying bikes this way isn’t anything new, a lot of riders figured this out years ago. Someone started throwing blankets or pieces of carpet over the tailgate to protect it and the bikes when shuttling riders up a mountain. Other companies have created a similar product but I feel that Race Face has designed a version that keeps the bikes in place and protected on whatever kind of road you are traveling. As you can see from the photos, this tailgate pad has padded blocks to help separate bikes. This is really helpful when driving up access roads and the bikes want to slide from side to side in the bed. 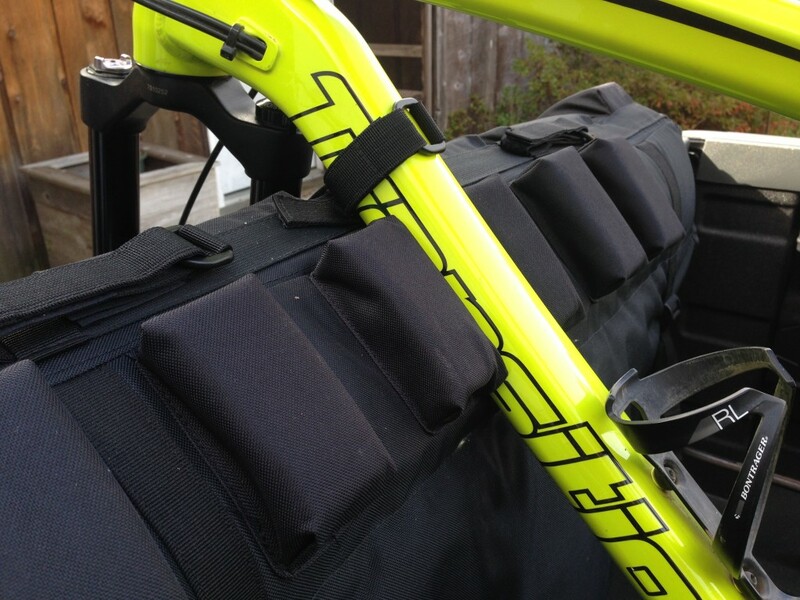 Also included on this pad are these nice downtube straps to help keep the bike secure. You can see the attention to detail that went into this pad, the quality and materials on this model are really nice. They even used a softer material on the underside to protect the tailgate from getting wear marks! *recommended for Toyota Tacoma, Ford Ranger, Nissan Frontier and other vehicles with compact cargo beds. *recommended for Toyota Tundra, Ford F150, Dodge Ram and other vehicles with full size cargo beds. So if you’re thinking about buying a pickup truck or have one already and need a simple way to transport your bike(s), pick up one of these Race Face tailgate pads!